Training Cave boxers Freddie Phillips and Aaron Bedford. 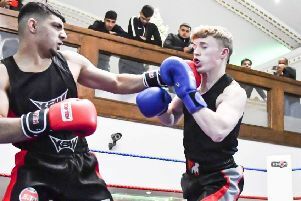 Birstall boxer Freddie Phillips faced his fourth fight of the season and maintained his impressive winning run against a more experienced opponent on a show in Peterborough last Saturday. Phillips, who trains out of the Training Cave Gym in Birstall, faced a tough bout as he appeared to let his opponent come at him in the first round but he settled into the fight and went through the gears in the second and third rounds to finish strongly and take a unanimous win to ensure a happy trip home. It was a third quickfire win for Phillips as he previously defeated Declan Blackley (Kingston ABC) on the KBW show in Batley having won on a show in Knottingley. Aaron Bedford made his debut and put up a great performance in an all action fight where both fighters didn’t stop throwing punches. Unfortunately Bedford lost but he showed great potential and is already looking forward to getting back in the ring.